Due to overwhelming request from our valued customers, we are now introducing our special version of crystal gem chips that are suitable to be filled into wealth vases, wealth ship, wealth pots, wealth bowls and the stomach of fortune symbols such as Pi Yao and Dragon Tortoise. Feng Shui enthusiasts use them as seven treasures because they contain multiple gemstone chips of different nature such as citrine, rose quartz, amethyst, adventurine, hematite, garmite, lapis lazulli, tiger's eye and much more. This is the secret ingredient for wealth vases, wealth bowls and wealth ships. 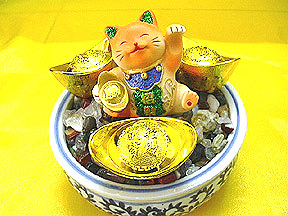 Wealthcat, gold ingots and crystal chips to create a "WEALTHBOWL"
Seven treasures provide the magical effects of nourishing all the seven chakras in human body. Each chakra in our body is associated to a color and multicolored gemstones will benefit us. They are able to emit good chi that is needed by all our seven chakras and dispel the bad energy in the surrounding to help us achieve our endeavour smoothly. Feng Shui enthusiasts are advised to purchase as much as you could afford to create your wealth vase, ships and bowls. We have made it more affordable for you now at an amazingly low price, so that everyone could enjoy good feng shui in return. A minimum of seven types of gemstones with different colors is the secret ingredient to create seven treasures. Fill up the gemstones into your wealth ship, wealth vase and wealth bowl. The wealth ship should be placed near your main door sailing into your home, while the wealth vase is hidden in the northwest corner or your sheng chi corner. The other alternative is to create multiple wealth bowls of your own and place them in your work desk, sheng chi corner, south west, west, northwest and bedroom. The wealth bowl could be filled up with these gemchips, chien lung coins and gold ingots. Wealth bowls are potent to build mentor luck and boost up abundance in long term for you life. This is what really rich people would rely on to build their riches and wealth from scratch.